No one gets rid of their Christmas tree by December 26th! Turn it into a new years tree. Adorn it with party favors and other dollar store trinkets to make it a fun transition into 2018. Left over champagne from Christmas celebrations? Add some glitter to your home in time for the new year. Add a subtle flare to your home with this wintery wreath with clear lights built in. Liven up your living room or shams with this throw pillow with poinsettia embroidery. Go bright and vertical! These draping lights add a noticeable but subtle touch to your home. 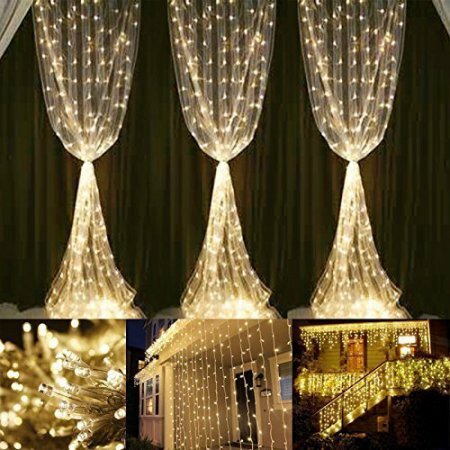 Hang these lights on your curtains, stair rails, or outside your patio to accentuate your less thought about parts of your home. Here is a fun way to decorate your home without burying it under mountains of lights and ornaments. Place these spheres in your bushes or hang them from your awnings to give your home an eclectic forest feel.